Can Monstrous Life Insurance Companies be reborn as Fluffy and Cuddly? The new Beagle Street life insurance TV advert taps into the perception many people have about life insurance companies. That they are monstrous. Difficult to deal with and “a bit of a nightmare”. But Beagle Street’s ugly Gremlin is reborn into a fluffy cuddly Mogwai look-alike offering a back rub. Effectively saying, “We’re different,” Beagle Street hits the spot for me. It’s short, funny and to the point. In the original Gremlins movie they cited 3 rules to prevent the cute, fluffy, cuddly Mogwai from transforming into evil, ugly Gremlins. Don’t expose them to sunlight. Don’t get them wet. And how ever much they cry don’t feed them after midnight. Life insurance has rules as well. Such as disclosing all relevant information during the application process. Time will tell whether Beagle Street’s fluffy approach will revert to hideous Gremlin many years down the line. I hope not. In the meantime if you haven’t seen the advert here it is. What do you think of the Beagle Street life insurance TV advert? Is it more successful that recent financial services campaigns? Please leave a comment below and share your thoughts. And click here to check out other classic Life Insurance adverts. Seven great speakers. Over 800 attendees. Loads of business ideas. 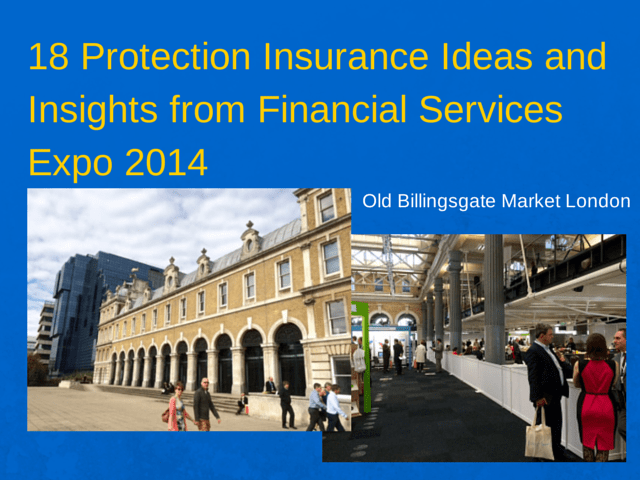 I enjoyed curating and chairing the Protection Stream at the Financial Services Expo 2014 in London. Focussing on the future of the protection market my speakers covered innovation, mobile technology, critical illness cover evolution, social media and content marketing. And some good old-fashioned sales ideas. Here are some bite sized ideas and insights from the speakers. 1. Johnny, 2014’s Protection Personality of the Year at the Protection Review Awards asked whether work-site marketing might be the future of protection? Should we be creating deeper relationships with SME’s? 2. Given that first time buyers are becoming older as they struggle to get mortgages, talking about rent protection is just is just as important as mortgage protection. 3. Talking about how the protection industry is still price driven, Johnny reminded me of an old Scottish Provident marketing campaign from the 1990s. 4. Jonathan described his vision of the future. There’s be no growth in the protection market without growth in protection advice. We won’t see Apple or Google coming into protection. It’s too small. Too regulated and has low margins. 5. Discussing complex language and jargon, Jonathan came up with the quote of the day. It really makes you think about the words we use in protection. 6. When developing any future propositions we should build the mobile version first and then move to more traditional web solutions. How many protection providers are thinking like this? 7. Alan argued that critical illness cover is too convoluted for consumers. And that it’s too confusing for advisers because they are not doctors. Technical guides range from 60 to 120 pages. Does anyone read these? 8. Asking how we can keep high quality plans but make them much simpler, Alan suggested combining similar conditions into categories. So if one category included 15 current critical illnesses that would be simpler. 9. Expect to see critical illness plans covering Lorenzo’s Oil Disease before long. Hear Alan talk about CI Expert on the MPAF Podcast. 10. Phil asked, “If we built CI from scratch today, would we end up with what we have?” Or would we have developed the “partial payment” model used by Pru Protect? 11. Using analogies of house insurance Phil said no one who spills red wine on their carpet would expect a replacement house. Why should critical illness be about all or nothing? 12. Phil wondered whether anyone had ever researched what people spend their critical illness payouts on. After paying off mortgages I am sure it’s holidays next. Hear Phil talk about Serious Illness Cover on the MPAF Podcast. 13. Derek asserted that financial advisers couldn’t afford to avoid social media. Social Media has replaced the Yellow Pages. 14. Don’t be concerned about compliance, but do be careful what you say. Derek used an example where he’d complained about a hotel on Twitter. He mentioned sleeping pills in the context of noise. Soon the police arrived concerned about what he might use his sleeping pills for. Hear Derek talking about Adviser Communities on the MPAF Podcast. 14. Continuing the discussion about social media, Simon said there are three truths about social media. 15. Social media is about PIE. People. Information and Entertainment. I like the tie in to Pete Matthew’s podcast interview where he asserts that modern marketing is all about education. 16. Simon showed how leads in social media come from a dialogue with clients and that sometimes leads are hidden in the conversation. Hear Simon talk about Online Marketing for Advisers on the MPAF Podcast. 17. Alan is a past master at getting sales ideas across. Some are obvious but we often forget them. Such as the price of two single life plans only costing pennies more than a joint life plan. Two potential payouts. Nearly the same price. “Compared to what?” he asks. A full Sky TV package at £80. A make over in a beauty salon? 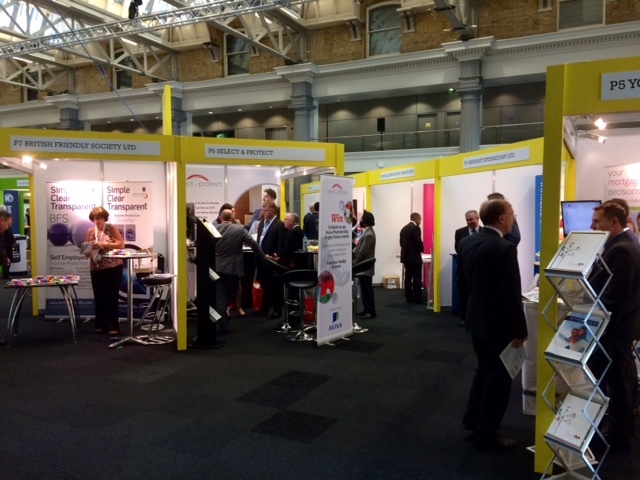 Were you at Financial Services Expo 2014 in London? Did you pick up any more protection insurance ideas and insights? Please share them. Add a comment below or give us a link to your own blog. And if you know anyone who would enjoy this article please share it with them.